One of the most frustrating thing about using Apple Mail signature is that the iPad / iPhone will always change the signature font to "Times Romans". Create the HTML-formatted mail signature in a mail client (e.g. Outlook) and send the email to yourself to receive in the iPad / iPhone mail app. In the iPad / iPhone mail app, copy the HTML-formatted mail signature from the email you received. On the iPad / iPhone, go to Settings >> Mail >> Signature, paste the copied HTML-formatted signature into the input box. 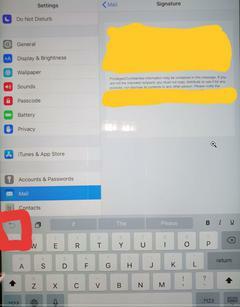 Important: Immediately after pasting, click the [Undo] key on the iPad / iPhone virtual keyboard (see red box in lower-left of image below). You will notice that the HTML-formatted signature will change to the original font style. From now on, when you send mail using your iPad / iPhone mail signature, you will get the intended font instead of the standard iPad "Times Romans" font.